Another marvelous couple of days spent in fine company with interesting excursions! That’s probably the best way to sum the 4th and 5th of September in Waikaia for our AGM. The standard for local hospitality was set very high at Awatere Station where we (all 35 of us) were invited into the main house for morning tea and chat about the Stations history and the King Salomon mine that was one of the biggest underground networks of shafts in alluvial soils of it’s era. Extra tales about the station and some of it’s characters were also told by our own members who worked on the station back in the early days. 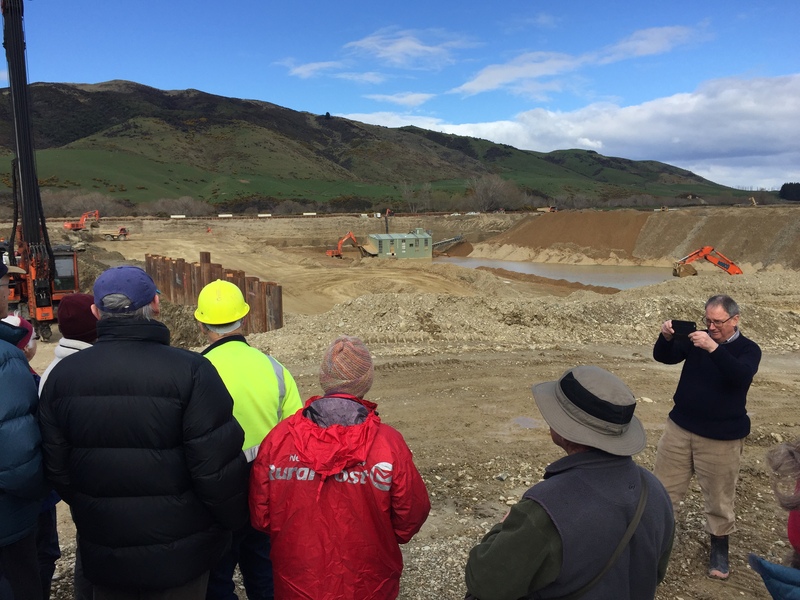 We then went for a walk to view some tailings and a great sluicings hole with a tale of a joker who faked his own death by driving a bulldozer into it… Special thanks to Denise and James Anderson from Awatere Station. It was a beautiful sunny morning after earlier snow so we did not rush our visit to Awatere. Therefore our AGM had to be postponed until later in the day as we attended to more important things like lunch at the Waikaia Hotel which was absolutely scrumptious and then on to the Waikaia Gold Company mine at Freshford. Alistair McKee gave us a very insightful talk about company then we were fortunate enough to go for a walk to a view point and see the whole operation in action! We were all impressed how the processing plant floating at the bottom of the ‘pit’ looked remarkably similar to the dredges of old – only real difference being no bucket chain feeding in the auriferous load, this being done now-a-days with diggers. From Freshford we went around the corner to visit a large winter feeding shed- certainly the largest in the district, on the property of Mike Thompson who has voluntarily made some significant sluicings on his property (just behind the shed) protected by covet from destruction. Another 10mins down the road and we were in Riversdale for a private viewing of a vast collection of Classic Cars dating back to the times of many of our members first vehicles! We enjoyed a cup of tea and a reminisce about previous vehicles owned, driven and on occasion crashed. From there we were back to our accommodations for a freshen up before the AGM proper at 5pm followed by another wonderful meal at the Hotel and then a tremendous local speaker William McKee – you can view his speech here. The Saturday dawned warm and calm (before the storm) as we enjoyed a great breakfast at the cafe across from the hotel and collected our packed lunches for later. We were met by Garth Mahon who lead us up to the old Chinese Cemetery where some headstones where still visible. We had wonderful views of Welshmans Gully and it was the best opportunity with approaching rain to have a bit of a walk. We then whipped out to Switzers to have a look there with Garth and hear a few stories of the area. A few of us were discussing it and it looks like the sluicings at Switzers shifted more hills and tones of soil than even Bannockburn or Gabriels gully? We were just heading back to our cars when boom! Down came the rain. Luckily our next stop was the community centre for morning tea where we enjoyed mouse traps thanks to Terry’s Mum and Dad who got up early to make a couple of loaves worth! We had a great talk here from Shirley Walker on the local museum committee and learned of their very ambitious plans for their wonderful new museum. From here we went for a drive out to Piano Flat on Terry’s assertion that the rain would soon clear, in fact, it looked like it was clearing already! Unfortunately the rain only got heavier but we stood a few minutes under the native trees of Piano Flat while Garth told tales of gold and farming exploits in the area which he was personally party too, including some hair raising bridge building shenanigans while the river was in flood! The ‘picnic lunch’ at Piano Flat was abandoned for the dry and roomy woolshed of Glenaray Station. Local, Peter Gordon was able to add to and build on some of Garths stories about Glenaray station and some of the old characters who worked here. Many thanks go out to the people of Waikaia who accommodated, fed and entertained us! Most of our members left with genuine plans to return and see more! Seeds were sewn about the possibility of another Cavalcade finishing here in 2018?? Watch this space!